Date of introduction to the Paris stock exchange: November 3,1993. Place of quotation: Euronext Paris. Compartment A. Eligible for SRD since February 26, 2008. ISIN code: FR 0000052516 (RIN). ICB nomenclature sector: Farming & Fishing. Close of the fiscal year: June 30. Vilmorin & Cie, with its defensive and long-term profile, regularly demonstrates the relevance of its development strategy on global markets that remain basically full of promise for vegetable and field seeds . Following the free allotment of shares made on January 21, 2019, the new Vilmorin & Cie’s capital stock stands at 349,488,703 euros divided up into 22,917,292 shares each with a nominal value of 15.25 euros fully paid up. Limagrain, the Company’s reference shareholder, has encouraged Vilmorin & Cie’s development since its introduction to the stock market in 1993. It guarantees the Company’s strategy of long-term growth and close proximity to the world of agriculture. 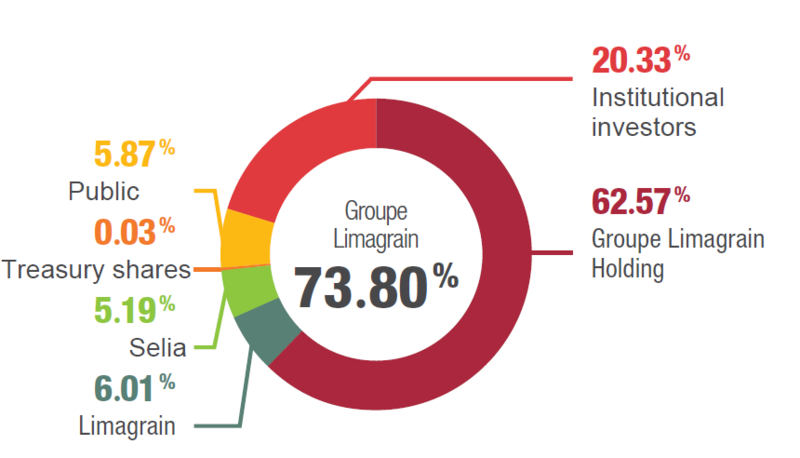 Limagrain directly or indirectly holds 73.8% of Vilmorin & Cie’s capital stock.